In my last post I talked about keeping up with what's coming (https://roadmap.dynamics.com) but I want to talk a little bit more about how I keep up. One of the tricks is to know and understand the real versioning or the back channel versioning that you can see when you select HELP/ABOUT in the software. Dynamics 365 Growth and well WOW! I have been working at Microsoft now for four and half years and one of the most awesome benefits of this is the learning culture and we get to attend TechReady and/or watch TechReadyTV. This is a time when internal resources are ramped up on all the latest and greatest and get opportunities to mix and mingle with the various product team members, program managers, visionaries, architects and more. We also get to get our questions answered and to build powerful relationships that help as we work with our clients. Go OneMicrosoft. So I can't talk about the details, but I can tell you that: Well WOW, you will not believe what is coming on the Dynamics platform and this is also motivation to go look at what was just released in December 2016. The increased internal recognition and appreciation for Microsoft Dynamics 365 as a powerful line of business application platform and the investment in adding to the platform in the same, great supported manner, just continues to blow me away. I also LOVE, LOVE, LOVE how closely the Dynamics R&D Team members are working with the other R&D teams, like the AZURE Teams and the Office 365 teams and so much more. The platform power together and the speed in which it is growing (major options every 6 months), just sends shivers down my back. Put your learning hat on and Embrace the change and growth. Search Super Powered! Microsoft Dynamics 365 Loves Azure! Dynamics 365 (online) users have a great new way to find what they are looking for. Relevance Search brings a powerful Bing-like, global search experience to your mission critical business applications powered by Azure Search! The Dynamics Communities 2017 CRM User Group schedule for the Washington D.C. Area has been posted. You are starting to hear about Microsoft Dynamics 365 and you want to learn a bit more? OH You are not using SLA's for cases yet either ... Well .. they are a unique learning area and you need to understand the strengths and version 1.0 variables. So tune up the grey matter and take a look at some of the following posts. 22 Hours, 44 Minutes and 48 Seconds to the official kick off of CRMUG Summit 2016 under the cloudless skies of Tampa. Saturday, Sunday & Monday included deep dive Academy training with field veterans ... Definitely a LEARNING packed week. AND here is the key, when you dive into the world of business applications learning and growing is what it is all about. Customers can leverage technology, in addition to their people and their business processes to kick it up a number of notches and we all need those extra notches in this crazy world. How Can you Get More? Add learning initiatives, support growth, hold people accountable to share what they learned. Remember what it is like to teach someone else? To teach you really have to understand, so how do you know what people retained from a conference? Have them teach it to their peers who didn't get to go this time. What about all those contacts? Well they often don't mean much unless there is follow-up. The idea is not only to meet people, but to build new relationships. How do you build new relationships? You stay in contact, you see each other each year, you participate. In Microsoft CRM you can have many knowledge base articles associated to a case, but what if you wanted to always associate a specific article to a specific case based on the type of case? This can be done using CONFIGURATION. Create a new N:1 relationship between Case and Article. This sets up the field for the CASE form to associate 1 article to the case. Once the relationship is configured, add the relationship to the CASE form of your choice. Most likely you don't want to select and pick the article when you create the case (although that is an option), but rather you want the system to automatically associate the article based on the case type. To do this you would add a process of type workflow that looks at the case type and appends the article you indicate. It is important to realize that an article can not be appended to the case until the case is created and as such the order in which the workflow fires is a variable. The Security on Case and Article might need to be updated to support Append and Append To. The Case Types might need to be expanded to cover all case types needed. The Articles should be created before you create the workflow so that you can pick the article you want to associate. CRM 8.1.0.00xx has three different knowledge base article entities as depreciation occurs so understanding which article to use is helpful. Workflows can be ASYNC or SYNCHRONOUS and each have their own strengths. In this situation there are advantages to ASYNC because of the timing of case save. Microsoft CRM and Calculate Fields offers some real power for adding scoring to a specific record. Take for instance a situation where five different departments work on a specific opportunity. You can configure the system so that each department adds a score to the opportunity record, such as a value from 1 (great fit) to 5 (Gaps), and the system can then add up these five scores and give the opportunity a more realistic probability for close. If Total Score =>1 and <=5 then set Opportunity Fit to "Hot Fit (Red)"
If Total Score >5 and <=15 then set Opportunity FIt to "Warm Fit (Orange)"
If Total Score >15 and <=25 then set Opportunity Fit to "Cold Fit (Blue)"
If you have not had a chance to see the incredible new functionality of Project Services then this little video is worth the 5 minutes that it takes to watch it. One of my greatest passions is helping and learning. Today as I walked the bridges of information helping where I can and learning, I discovered a few new links that are worth tucking into your CRM back pocket. There is a new tool in town for solving the complexity of issues in this world of many, many different applications and just as many versions of applications and operating systems. Microsoft Support and Recovery Assistant (SaRA). So take a stroll and learn a little and along the way pay it forward. I might have to take some time away from projects to go to this intimate and intense seminar that includes not only training, but also real life sharing from the field. If you are working with Dynamics CRM then this is a must attend. In case you have not heard Microsoft Announces the SPRING WAVE of Microsoft CRM 2016 with FieldOne and ADXStudio integration. Did you know you can learn even more now? Check out the FieldOne Case studies and learning center here! Check out the ADXStudio Community here. Now this session looks like a real winner! Given all the BUZZ coming out of Envision it looks like the conference was a success in meeting it's goals of sharing the vision! If You Are Planning for Next Year? "What can you expect at Microsoft Envision? Gain crucial insights: Microsoft Envision delivers business insights and technology expertise at every level. Business leaders, including Microsoft CEO Satya Nadella, and a variety of world renowned third party visionaries and thought-leaders will share what’s next, what’s trending, and how to capitalize. Discover new solutions: Find sessions and learning opportunities that allow you to explore the topics and opportunities that are specifically relevant to your industry and role. Discover successful strategies, disruptive technologies, and next-level thinking that will help you make smart decisions about the future of your business. Build lasting connections: Connect with innovators, technology partners, colleagues, and visionaries, and build professional relationships that will last for years. We’ve created numerous opportunities for you to learn and share with others who have tackled (and solved) some of your same business challenges. If you’re a business leader who is charged with making or influencing key business decisions within your organization, you’ll gain tremendous value at Microsoft Envision. You’ll find a depth of resources here that will help you not only come away better positioned for your future, but help you discover how to take advantage of solutions today that will deliver immediate results to your business. New technologies are rapidly transforming the world. Businesses that understand the available technologies—and anticipate what’s coming next—are able to quickly leap ahead. Microsoft Envision gives you the insights you need to take advantage of the evolving business landscape. 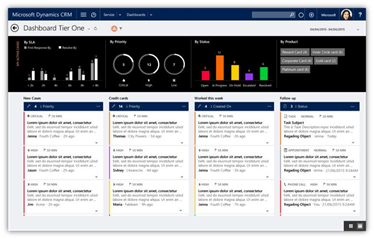 Find out more about how Microsoft Envision can help business, marketing, sales, finance, customer service, operations and IT leaders across a variety of industries excel." "Big things are happening in the Microsoft Dynamics CRM world"
Build your own mobile app for Microsoft Dynamics CRM on Android, iOS and/or Windows. Start with the Mobile Focused area of the Microsoft Dynamics CRM Developer Center. One of the big areas of development for the Microsoft Dynamics CRM 2016 release has been mobile! Consider multiple operating systems (Android, iOS Apple, Windows), distributed processing (The Power of Azure and the Cloud) and a giant world of choices (One person with an Apple phone, another with a Windows Tablet). Microsoft has always been good at offering a ton of choices. So you can use all of the choices offered by Microsoft OR you can dive into creating your own. If you align with the team, you leverage the SDK and you write awesome code, the world is yours for the crafting! Product Recognition: Way to Go Microsoft Dynamics CRM! Relationship Management Software is as deep and complex as the relationships that it is tracking (easy as you and I, complex as you and everyone you know and why) and numerous choices can make it even more complex (do you track the buildings you visit, the people who influence the decisions you depend on?). YET choice is what makes for a great offering as it morphs to fit businesses from one model to the next. Not only businesses, but the ever changing nature of businesses and the uniqueness of your business. 1) Make sure you have the people (or support from people) in place that understand the product inside out and backwards. The strengths, the weaknesses, the reasons behind all that is offered and how to leverage those reasons to meet your needs. Also make sure these people have time for continued learning. Everything keeps growing and offering. 2) Make sure you honor and respect the product. If you don't host your own website then perhaps you don't want to host your own web based applications. Leverage the offerings and power of CRM Online which is backed by data centers layered in physical and virtual security. Check out the CRM Trust Center for more information. 3) Polish up your processes. Define consistency, eliminate crazy edge cases and understand what each and every person is doing to get the job done. They have found their own efficiencies, adopt the efficiencies. Consider things such as thinking hard about "alerts" before sending an e-mail alert after everything that happens in the system. Do people really need more e-mail? Leverage Dashboards, charts and PowerBI graphics to really understand the data that gets put in so that putting the data in the system makes a whole lot of sense to everyone. Share the results.